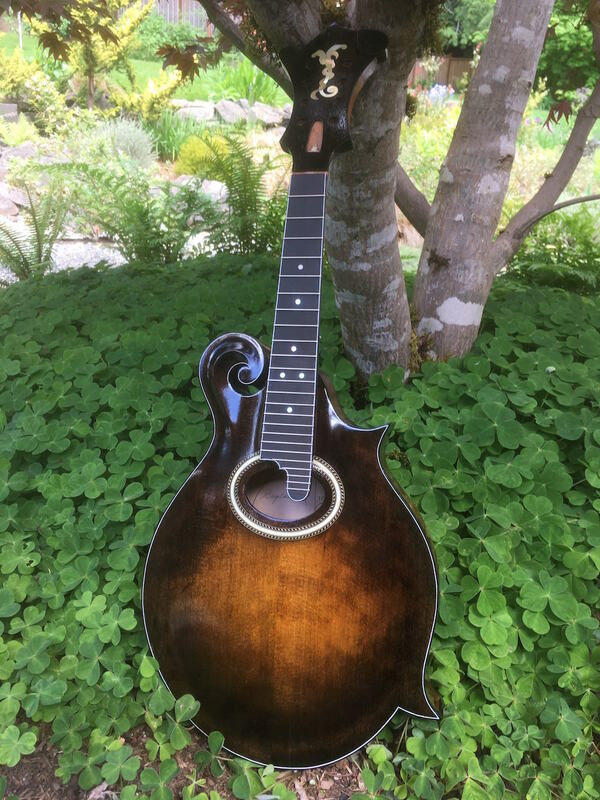 A friend asked me to put a finish on a mandolin for him. He's done a good job building the instrument, but there are a few spots where the rosette could use some finessing. Basically, it looks like he used two pieces of a white plastic binding material (ABS?) to create a double-wide center ring. The problem is that he let some stain creep in the thin crack between the strips and now there are some discolored areas. I've tried scraping back and that has helped reduce the brown color, but it's not completely clear of stain and wider crevices in the plastic are starting to appear. Does anyone have any advice on how I might fill those areas, or successfully melt the plastic pieces together to form a more uniform surface? George, in the stain vs dye thread I mentioned an article in AL by James Condino where he demonstrates a hand applied stain on a mandolin. He comments that he seals his (wood) binding with a couple of coats of shellac, but sometimes gets a little stain on it, in which case he uses household bleach applied with a very fine brush to remove it. I've always been able to scrape plastic binding but you might try the bleach trick (probably on some scrap binding so you don't muck up the instrument. Second comment is that people do melt plastic binding with acetone, in fact some people make their own binding glue by dissolving some binding in acetone. They say it fill gaps fine - again, I haven't tried it. Excellent ideas! Thanks. Seems I need to dig up that article. I'll post some pics when all is said and done. One last idea, I recently replaced a section of white binding on an old Les Paul. There was a line between the old and my new piece - I simply filled it with a tiny bit of white model enamel paint, then shot some amber lacquer over that to match the aged finish on the rest of the guitar. I know that enamel and lacquer aren't supposed to be compatible but it was just a hair line crack and it came out fine. Thanks for suggesting another possible solution. Your help is greatly appreciated! I have used the binding goop where you dissolve binding in acetone. Break the binding into small pieces and then put them in a glass jar with enough acetone to cover. Let it sit for a day or two and then mix it up. Thin with more acetone to get the goop to a consistency of thick cream. Apply it to your crack with a toothpick, and don't let it build up too far above the surface as it will melt the existing binding a bit. Let it dry for at least 24 hours then sand it flat. The goop works good as a filler or glue and the color match will be perfect. Joints in the binding will disappear. Be aware that not all plastic binding will melt in the acetone. Well, I tried bleach and that didn't help. Since I don't have any extra of the material used to make the center ring I can't soak it in acetone to try and make a goop. I did place a couple drops in an inconspicuous spot beneath the elevated fingerboard extension to see if it would soften the stuff but nothing happened. Maybe the acetone trick wouldn't work even if I had more of the material. Anyway, I'm going to try a little paint to see if I can hide the stain. If that works I can probably drop fill with CA, scrape back to level, and be on my way. It's interesting trying to problem solve these things. Update: I tried using paint but it looked pretty bad. Since I couldn't get the existing material to meld or amalgamate in an acceptable fashion, I decided to try the old nut slot repair trick of using CA and baking soda to drop fill the tiny cracks where the stain was visible. To my delight, it worked! I then scraped the CA level and went about my typical finishing schedule of wiping on varnish. It's not perfect, but you have to get down real close, hold the instrument just so, and squint hard to see the imperfections.